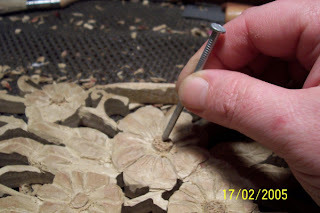 The basic tools used in woodcarving are knives, chisels, gouges, power carvers, sanding items and sharpening supplies. 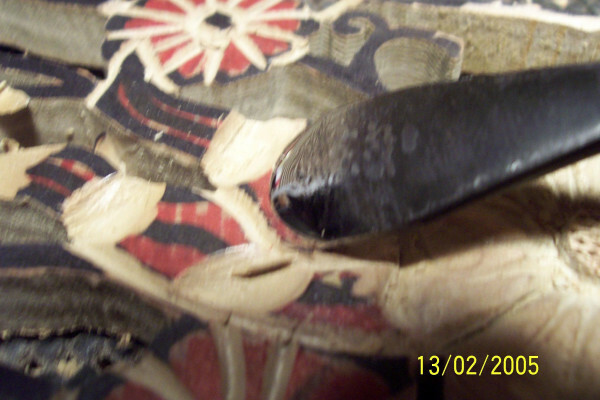 I have seen some pretty fancy knives being used for whittling and carving. While there are many great knives produced by individuals and carving tool companies, the best value for the beginner I have found is the Swedish slloyd knife. If you look around on the internet you can find one for around $10. The steel used in these knives is excellent and will hold a great strong edge for a long time. They come in various sizes of blade, 5″ down to 1″. 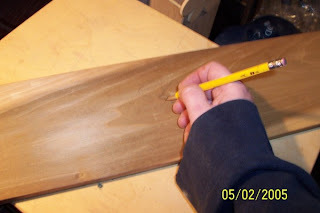 It is advisable that you also get yourself a decent bench (utility-all purpose) knife so that you do not resort to using your carving knife for anything but carving. 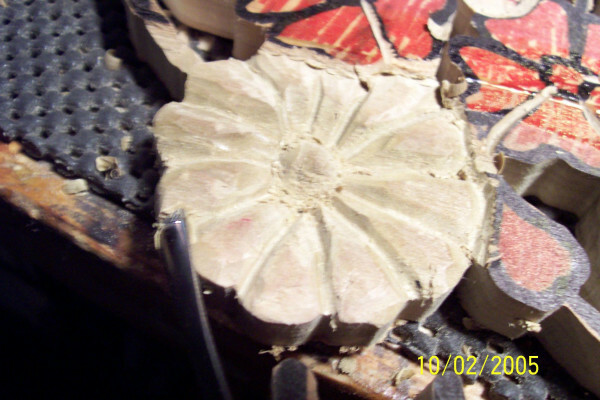 When I began carving, I made the mistake that most beginners do. I placed quantity above quality. I now have a world class collection of tools that I will never use again, cluttering up my workshop. Bad tools will only serve to frustrate and perhaps, injure the beginning carver and may be the reason why some give up carving before they’ve really even started. In the world of carving there are tools not worth a dime, decent tools and quality tools. 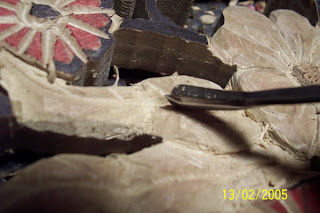 Understand that the following advise is only my opinion, but my opinion is based on my own experiences as a beginner and the advise of some other professional carvers that I have the pleasure to know and learn from. To get you started, remember to only spend your money on decent and quality tools even if you must purchase them one at a time in the beginning. There are some decent tools which can be found on some of the internet auction sites. For about $40 or less, You can get a set of 6 starter palm tools. These brands include but are not limited to Miller Falls, Crown, Sculpture House, Warren and Woodcraft just to name a few. They are of sufficient quality to sharpen and hold an edge well and can allow you to gain carving experience. If looking on auction sites and other internet carving tool sites, do not take their word for how good these tools may be (that’s how I wound up with a nice collection of garbage), ask someone with more carving experience than your self for their recommendations. 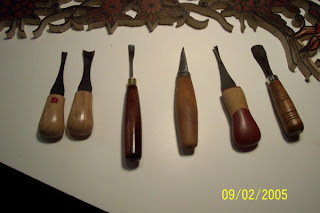 A starter set should contain at least a straight chisel, a veiner, a gouge, a skew chisel and a v-tool. When you have decided that carving is for you, it is time to look into the higher quality end of carving tools. These can range in price from $20-$100 or more, for a single tool. 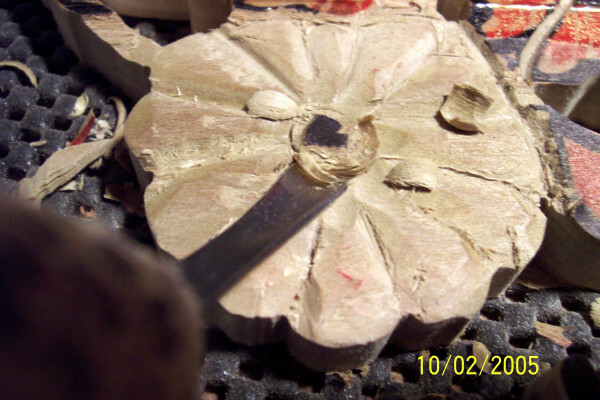 The progression in the quality of my carvings has equaled the quality of the tools I have amassed. As this can be a huge financial commitment over time, it is not recommended that you go out and spend your nest egg just to have a set of pretty tools. If you are independently wealthy and can spend what you like, please buy complete sets of top quality tools and feel free to buy me a set or two. I will forever appreciate it. However if your just trying to get by like I am, purchase tools as you need them. You can buy a tool a month or every 2 months depending on what it is you can afford. 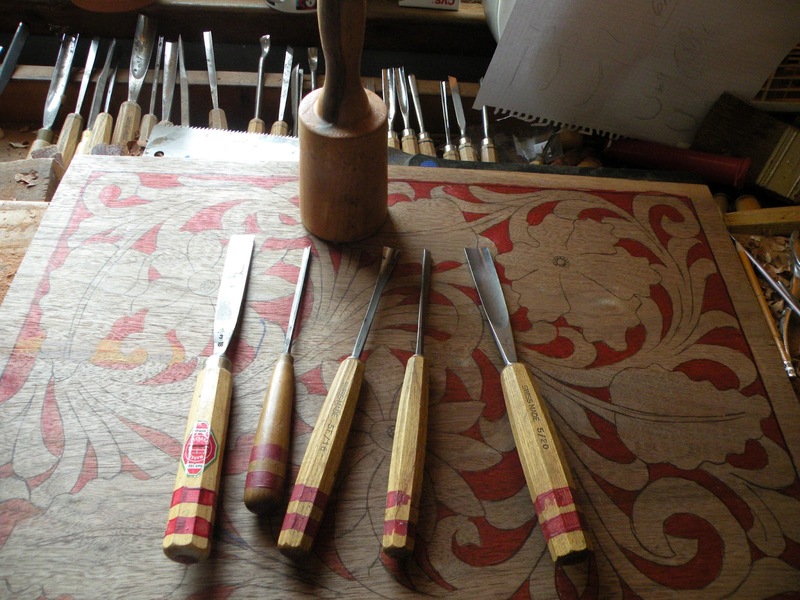 Over time you can build a wonderful set of tools, that other carvers will envy. I purchased my first set of real tools after requesting cash as a birthday gift. Everyone’s gift combined allowed me to buy a 12 pc set of quality tools. I now build onto that set one or two tools at a time and I have to say I have a nice selection of tools without breaking the bank. 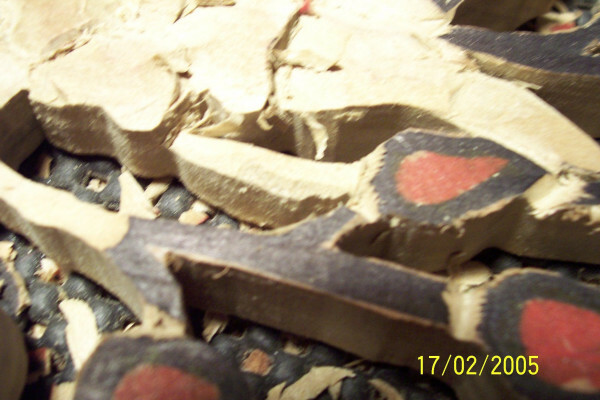 Quality tools are brands such as Stubai, Pfeil (Swiss-made) and Two Cherries although there are many others. 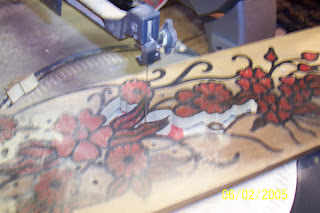 Many carvers I have met also swear by Flex-cut(PA), made in the U.S. and considerably cheaper than their overseas competitors. There is a great investment in good tools and the beginning carver is encouraged to take care of his/her tools by using them properly and keeping them safe, clean and dry. A cap on the end of the tool protects it nicely while in your toolbox. 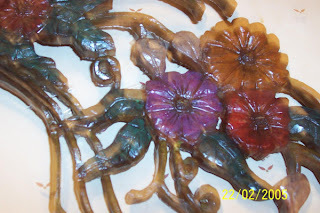 You can make these from rubber tubing, cork or Styrofoam. Tool edges should not be banged against each other, nor should they be allowed to fall from the work surface. 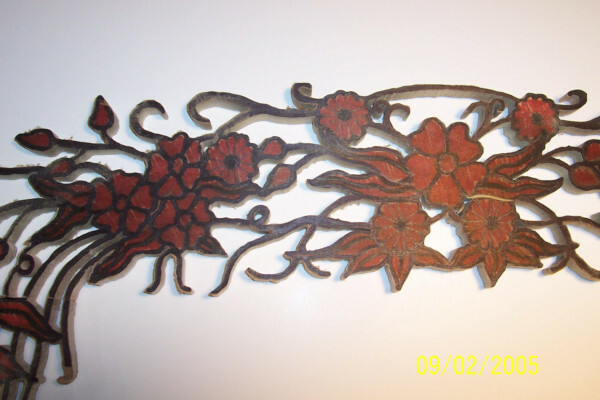 If humidity causes a problem with rusting, lightly oil the metal. 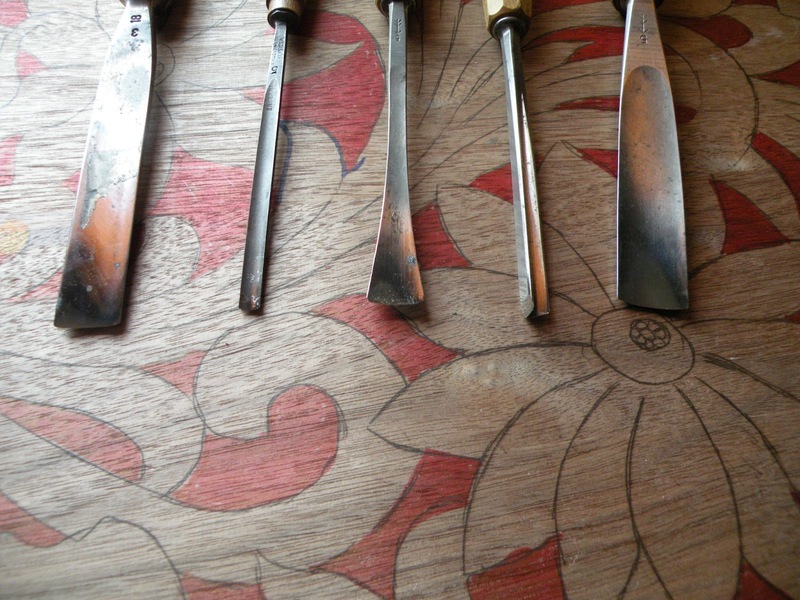 Carving tools come in many different sizes and shapes. Tools manufactured outside of the U.S. have a numbering system you must understand in order to know what you are buying. There are usually 2 numbers separated by a slash. The first number represents the curvature of a blade. 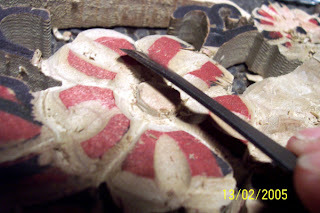 1 = a flat chisel and 9 = almost a semi-circle. The higher the number, the more curve to the blade. 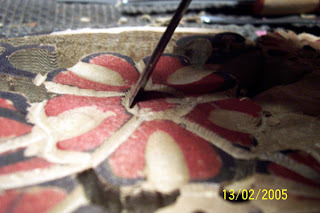 The second number will indicate the width in millimeters. American tools will have this number in inches. 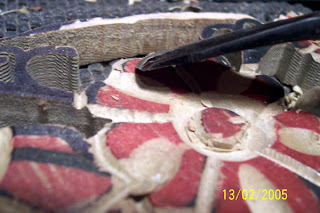 Micro tools can be extremely small and tools widths get wider as you move on up to the largest, the sculptors tools. 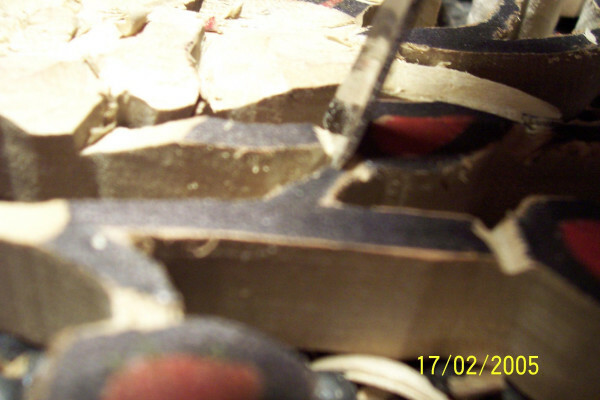 mallet tools are constructed differently so that they will take the force of being struck repeatedly. 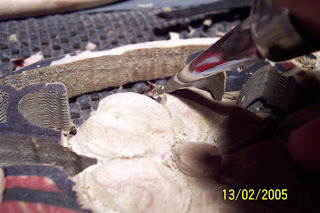 Do not use a mallet with micro or palm tools as you will destroy the tool. Do not use a hammer in place of a mallet. Generally, the price of tools gets higher as the sizes get larger. sanding supplies should include power sanders, scrapers, sandpaper, riflers, files and other abrasives. For sandpaper, the larger the number, the finer the grit. Start with a lower number, working to a higher number depending on the finish you desire. 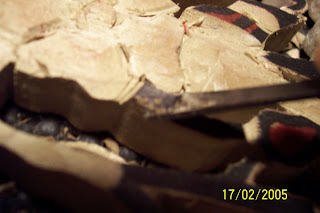 A crumpled up Kraft paper bag can be used for a very fine sanding. Totem poles are an artistically creative form of historical story telling. To the uneducated eye, the totem pole appears to be a wood carving with creative art symbols and animals but nothing further is understood. To the cultivated eye each symbol on the totem pole shares a piece of information about the person or clan it represents. 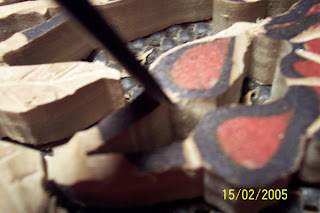 Most importantly, all symbol pieces are totems which are brought together to create the total totem pole. There are four basic kinds of totem poles. The poles that are carved to celebrate a special event are the memorial poles. These poles are festive and honored (not worshipped) for the occasion, such as a wedding, birth, and so forth. Often poles are actually part of a house or structured building design. These are house posts totems. The poles that can be seen standing in front of a house near the entrance are referred to as house front poles or family totem poles. These poles obviously classify the family and their ranking in the community along with the clan they are a part of. 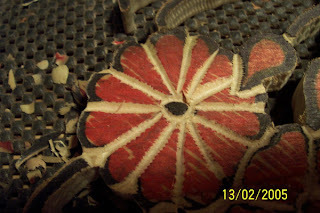 Family crests most often decorate these carvings. Last but not least exists the grave or mortuary posts. These poles are significant to native chiefs, for they are the poles used to support the box containing his body once he has died. Animals have their separate identity in nature which differentiates one specie from another; natives have their separate identity in a clan which differentiates one clan from another. Totem poles are a form of art which essentially provide a system of classification amongst natives. It is important to note that totem poles don’t just classify a clan, often they serve to classify the rank of natives since rank is viewed as important. Rank goes from chiefs of the tribes, followed by chiefs of the clan, to chiefs of the house. The taller the totem pole, the higher the rank of significance. The animals on the poles represent a kinship group which a native has a legendary relationship with. It is even said the first totems were animal images that natives believed to be their ancestors. It is possible for different clans to share a common animal symbol, such as an eagle, and therefore confusion may exist in recognizing which clan a totem pole may represent. Just by researching the colors of a totem pole it becomes obvious that every detail on totem poles has a purpose which must not be over looked. To understand the totem pole, one must understand the picture symbolism that is presented. There are several native clans, and each clan is represented by a different native animal symbol. The artist of a totem pole may share his/her responsibility role by including a totem that displays the animal of his clan. The animal totem in turn represents the responsibility role. Leadership is displayed by a bird, crane or loon totem. The bear clan is responsible for protection and defense and a member may choose to include a bear totem as part of their pole. A totem pole that represents the fish clan would likely display fish to symbolize their role as healers and scholars. The hoof clan would likely choose animals such as the sturgeon, bear or beaver to symbolize their strength and resourcefulness. Animal symbols not only represent a clan but also represent the power and characteristics of an individual. Each animal has it’s own powerful symbolism. Depending on the tribe, the animal symbolism will slightly vary but in general most represent the same beliefs. In the Ojibiway tribe, the eagle symbolizes courage and pre-knowledge, some tribes also see it as spirit and bravery. The bald eagle symbolizes foresight and discovery. The bear represents strength and courage. Perseverance and guardianship is symbolized by the wolf. The buffalo or bison is considered to be a symbol of abundance by many tribes. Another popular animal is the beaver, it is a token of resourcefulness and represents those who mind their own business. The coyote is a trickster who educates through humor. In the Ojibiway tribe, the turtle represents the oldest traditions. It’s animal power symbolizes birth, mating and death, along with communication and emmisary. Animals are not the only symbols found on totem poles. Often human figures are used to show the role of a native. The human symbol may show a native hunter, fisher, medicine man, trapper or other working role to represent an individual or clan. Carvings of human figures allows for the onlooker to have a greater understanding of the role of a clan. To demonstrate an example consider the marten clan and hoof clan of the Ojibiwa tribe. The marten clan is responsible for providing food; it would not be uncommon to see a carving of a hunter on the totem pole of a marten clan. Where as the hoof clan takes on the responsibility of providing medicine; it would not be uncommon to see a carving of a medicine man on the totem pole of one of it’s members. 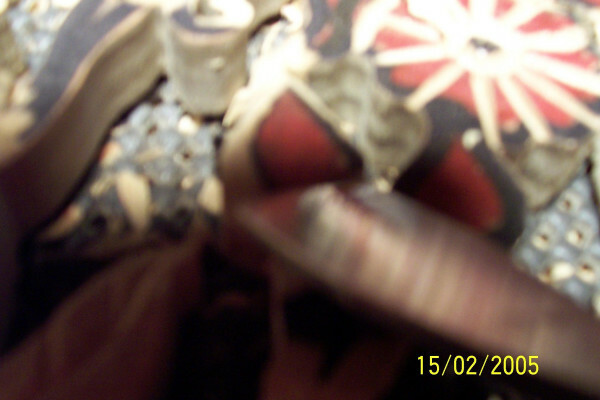 Along with human and animal totems, mythical beast carvings may also be found on totem poles. Creative beasts are portrayed on totem poles for they relate back to ancient native stories which often spoke of their mystical presence. Natives display totem poles not only to provide artistic history, to many they also provide security. Many believed that the totems chosen would serve to protect them from harm. The erection of a totem pole would usually be accompanied by a potlatch. to make changing the bits easier and second, get yourself a flexible shaft. This should be your most expensive accessory at around $20 but trust me, if you’re planning on carving, you will definitely want one. instead of holding the unit(which is heavy, clumsy and hot after awhile) you can hold the hand unit of the flex shaft which is like holding a thick pen and you will be able to comfortably carve at any angle. 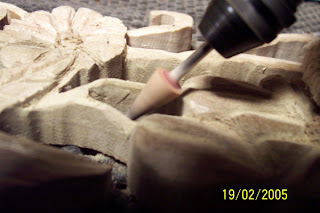 I have included the links below to my favorite carving bits. Buy at stores where they sell genuine dremel bits so you don’t have to worry about quality. they are cheap enough. They smooth and shape rather than carve and work well to clean up your carving. They also have sanding bits but the grinding stones work better in my opinion. Carbide-tipped bits: more expensive than other bits, but they stay sharp much longer than steel, high-speed steel or titanium bits. As for how narrow bits are……I can’t find info on exact sizes. I can tell you dremel makes some extremely small cutters but when you get into dental and industrial bits they are measured in microns, something no carver should ever need. Honestly it is just the tip you need to worry about and almost any bit that comes to a point will suit your purposes. 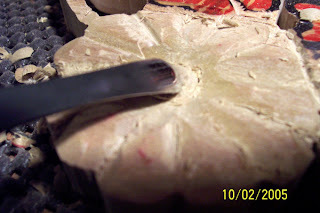 They smooth and shape rather than carve and work well to clean up your carving. Carbide-tipped bits: more expensive than other bits, but they stay sharp much longer than steel, high-speed steel or titanium bits and can be used on harder woods and other materials. As for how narrow bits are……The exact sizes are included on the dremel site but I can’t stress enough how important it is to eyeball the sizes in person until you become more familiar with the bits. I can tell you dremel makes some extremely small cutters but when you get into dental and industrial bits they are measured in microns, something no carver should ever need. Honestly it is just the tip you need to worry about and almost any bit that comes to a point or almost to a point will suit your purposes. design completedthis is the final design, ready to be cut on the scroll saw. 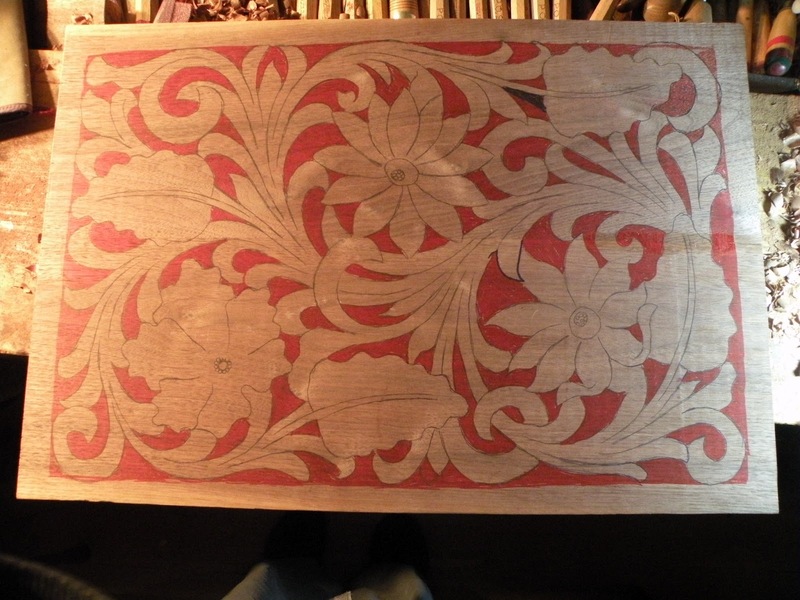 close-upclose up of final pattern now ready for carving. 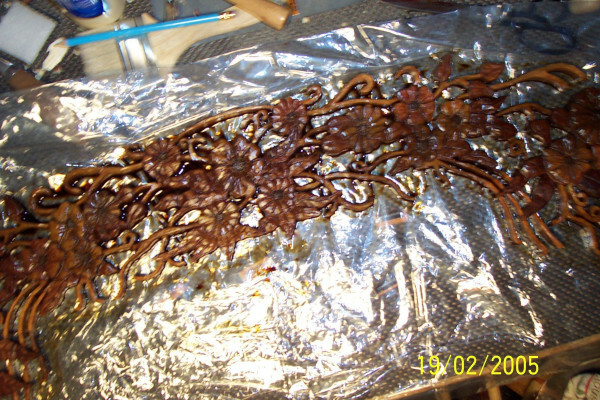 from this point on, the carving will be very delicate to work with because there are a lot of unsupported tendrils. 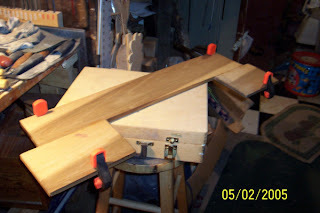 I will lay it flat out on top of my workbench for the carving, using an anti-slip mat under it so that it will not require clamping down. using clamps at this point would likely break off some of the unsupported tendrils. as this will be a delicate carving I have selected small hand tools to do the job. Left to right: #5 gouge, #7 gouge, #1 bent gouge, sloyd knife, 60o v-tool and a #3 fishtail gouge. 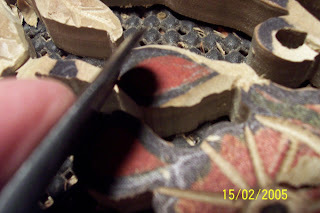 After selecting tools 1st step is to hone them so that they will slice thru the wood cleanly. 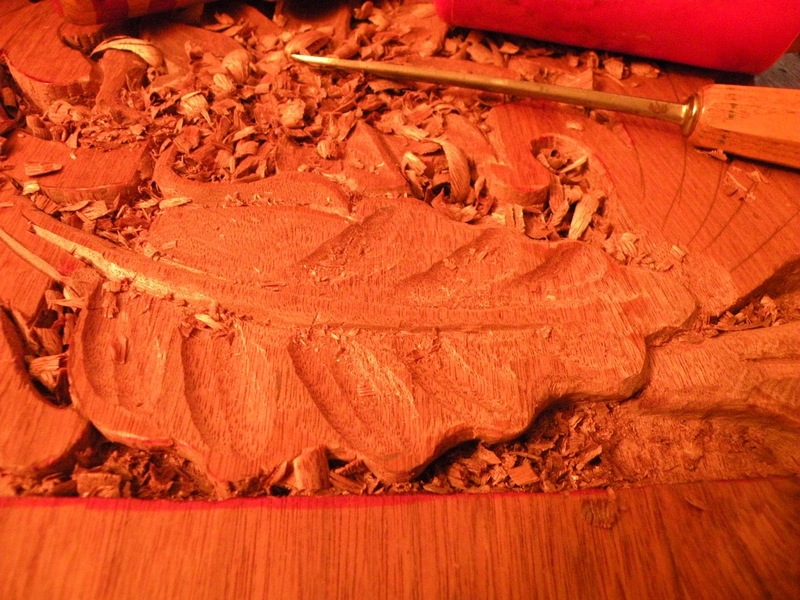 They will be honed repeatedly over the course of the carving stage. this is an important step in this carving as any unneeded pressure will break off the delicate pieces. 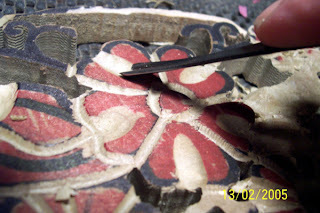 Gouge out a section approx. halfway on the leaf. This will give a wave to each leaf. Went into my wood stock the other day and came away with a really nice slab of black walnut. I know what I will do with it. 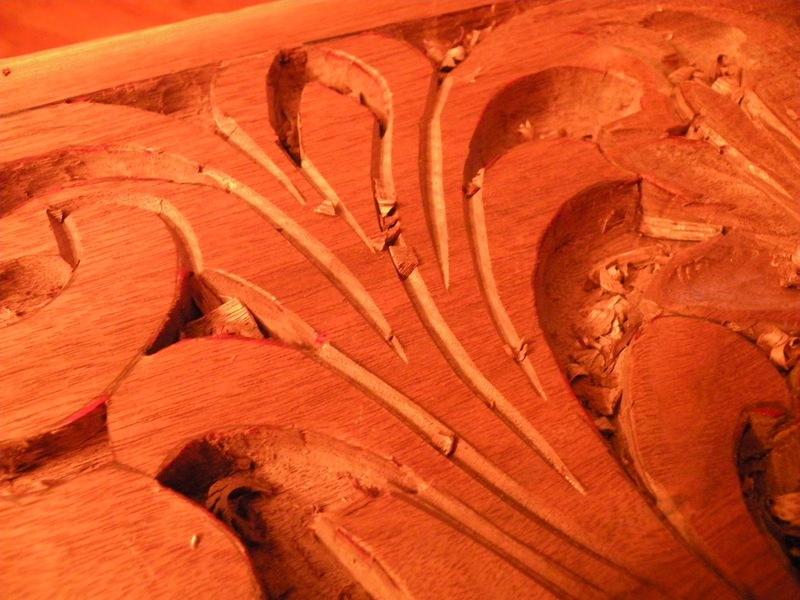 There are a couple of ways a carving usually comes about. There are those times when a piece of wood calls to you. It whispers into your minds ear and tells you what it will become. 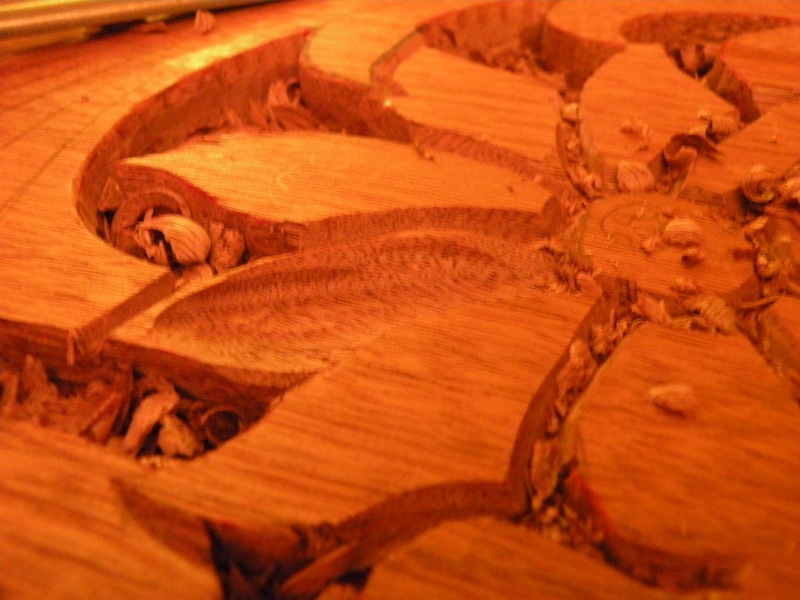 Other times you will find something you wish to create and then search out the right piece of wood for the project. This will be one of the latter types. Every now and then I set out to do a carving just for myself. Most of the time I am busy doing carvings as gifts or because they have been requested by family or friends. So now when I do a piece for myself, I try to do a “wow” piece. In my everyday life I come across images which inspire me and I keep them in a file stored on my computer. 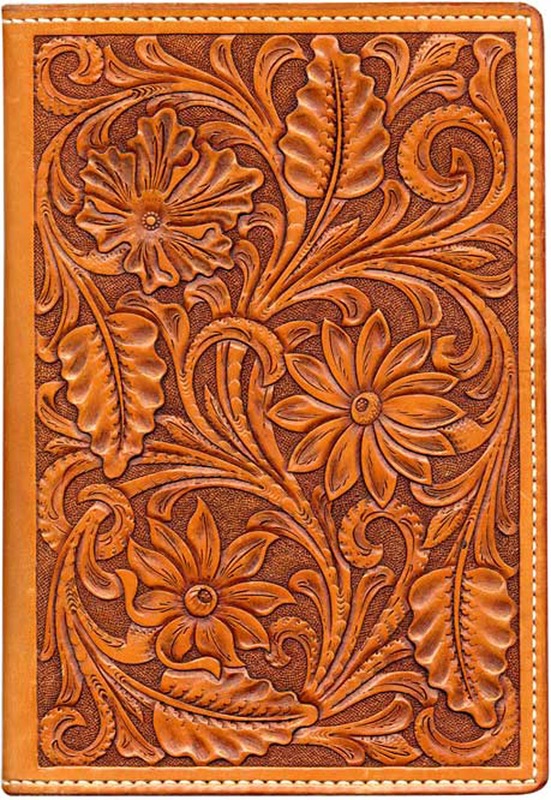 I have long admired the designs used in leather craft and I think they easily cross over into woodcarving. 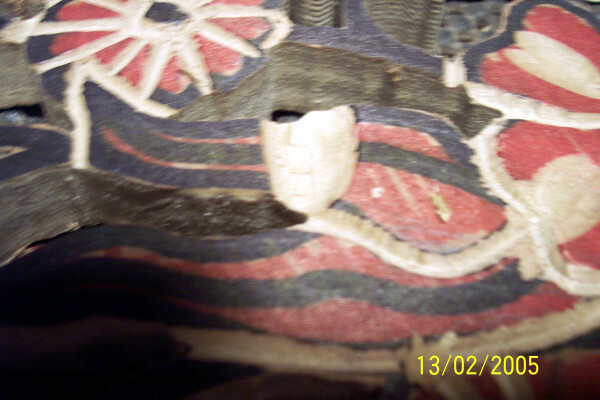 They are almost very shallow relief carvings. 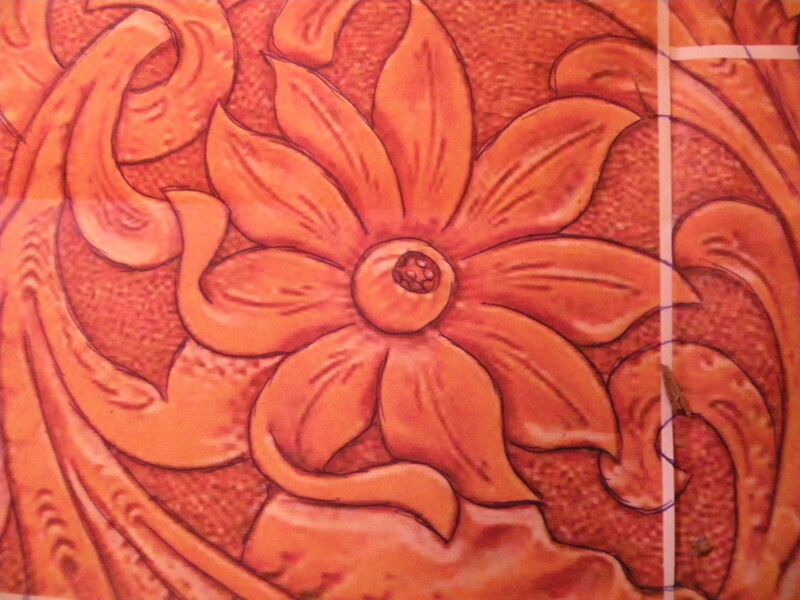 This particular design is a leafy swirly pattern with a textured background. 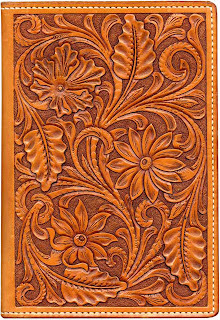 It will be my first carving which uses leather craft as its inspiration. In my mind’s eye I am picturing myself transforming this design into a deep relief with lots of undercutting which will give the finished carving great shadowing and make it interesting to the viewers eye. In my early carving years, I simply would have used it and given it no thought, but now that I consider myself an artist I am mindful of other artists copyrights. I routinely make my own original designs these days but every now and then I come across a design that is so appealing to me, I just want to use it to make a carving from. I did my research and found out whose design it was. His name is Jim Linnell. 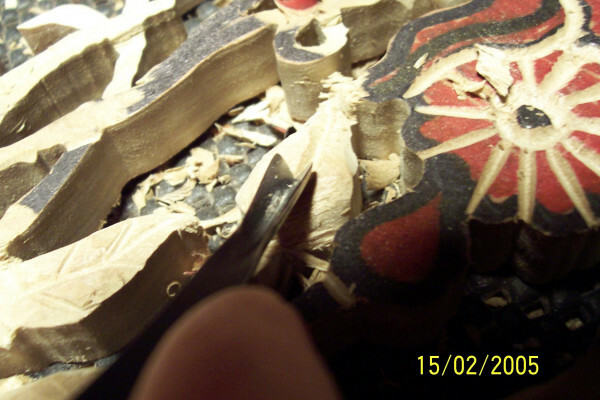 I sent him an email asking his permission to use it as a basis for my next carving. He said me choosing his work was quite flattering and he gladly gave his permission. I will keep a copy of the email for my records. 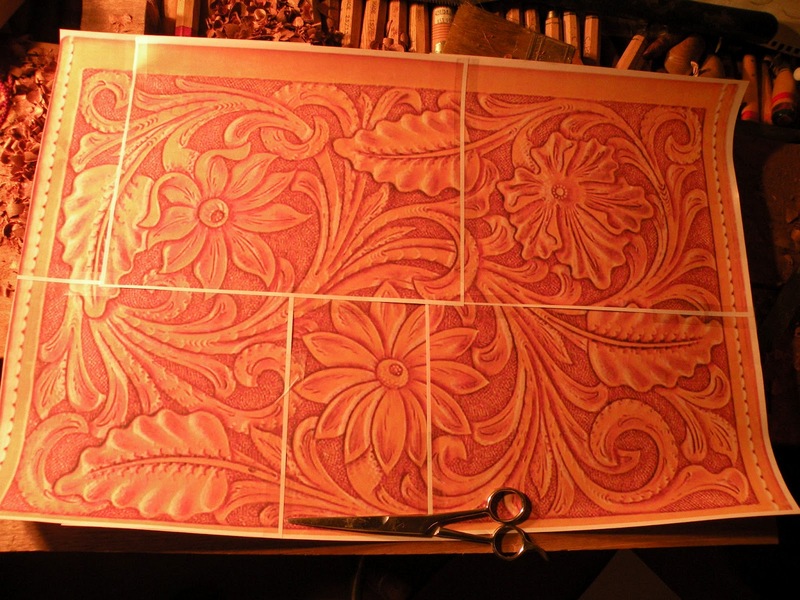 Using a photo program, I re-sized the pattern at 16″x23″ using 16″ as a base since that is the width of the walnut slab. 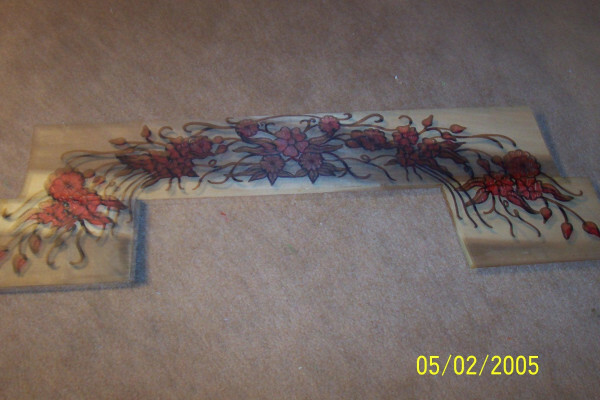 I asked a friend of mine to cut the slab of walnut to match the 23″ length that the pattern will require. I will get the panel back in a few days and then the carving will get underway. This is a beautiful clear slab of black walnut. 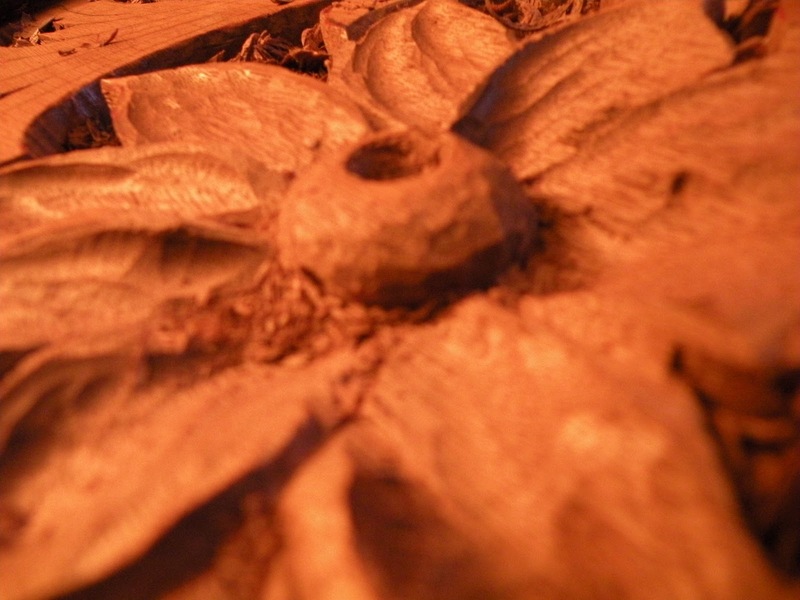 Anyone who has ever carved black walnut knows that the hardness of the walnut will add a difficulty factor to the carving so this will not be a quick carving. However I should be rewarded for all the extra work. It should turn out beautifully. I expect it to take a month or more to carve. 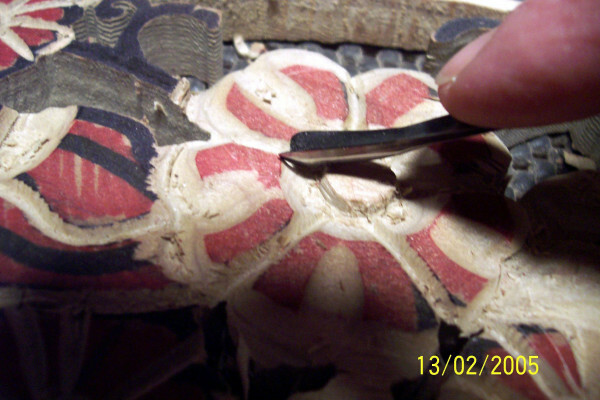 The way to approach a carving of this size is to do a little at a time. 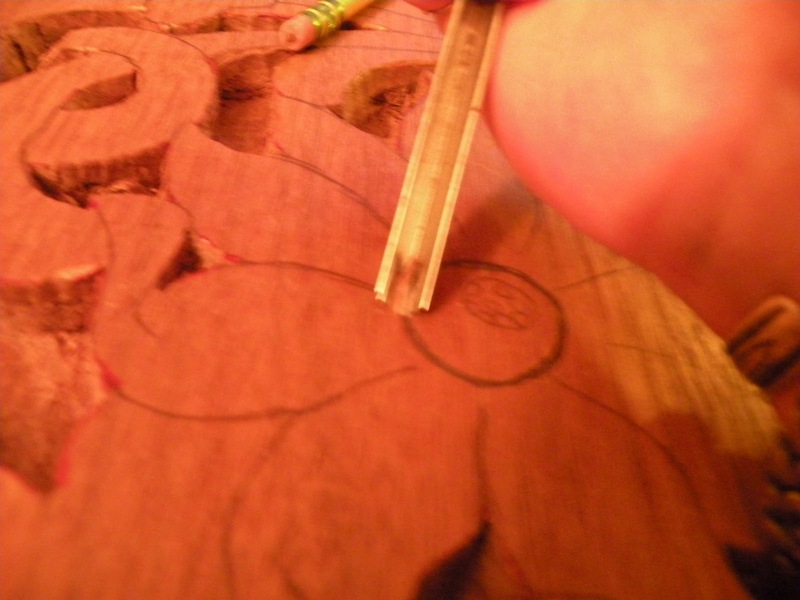 Hand carving will mean a pretty good workout for my hand, arm, shoulder and back muscles. Slow and steady will win this race. And you thought carving was easy. I have printed out the pattern to the correct size using my home printer. I have taped the pages together to form 1 large pattern. As this is a complicated patten with lots of intertwined positive and negative spaces so I have taken the extra time to color code this so I don’t make any mistakes when removing the areas that need to be removed. Even when doing the color coding I made a mistake as evidenced by the black marking in the upper right corner. It just proved the need for taking the extra time to do the coding as the eyes can fatigue while looking at a large complicated pattern. I have checked and double-checked to make sure it is all colored correctly. These are the tools I will be using for the basic wood removal stage. They are relatively flat profiles, # 3, 4 and a small # 5 to get into the tighter areas. 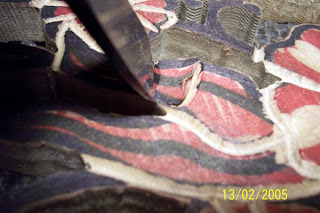 There is also a v-tool here to help keep the bottoms of the cuts perpendicular to the surface. 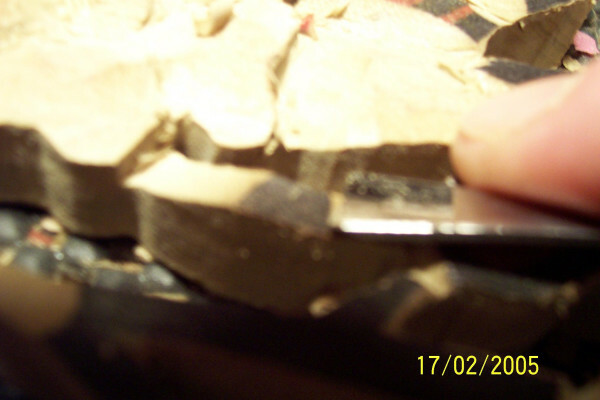 This is the proper way to hold a chisel when working with a mallet to stop-cut the areas needed to be removed. 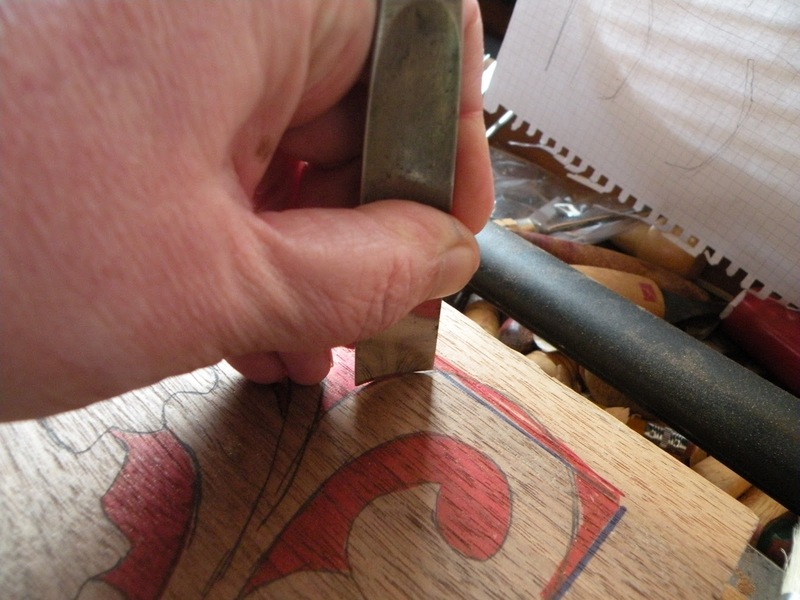 Holding the tool like this allows for quick placement of the cutting edge when going around the pattern lines. Place tool, whack, whack with the mallet. Place tool, whack, whack etc. Working this way you get into a nice steady rhythm. 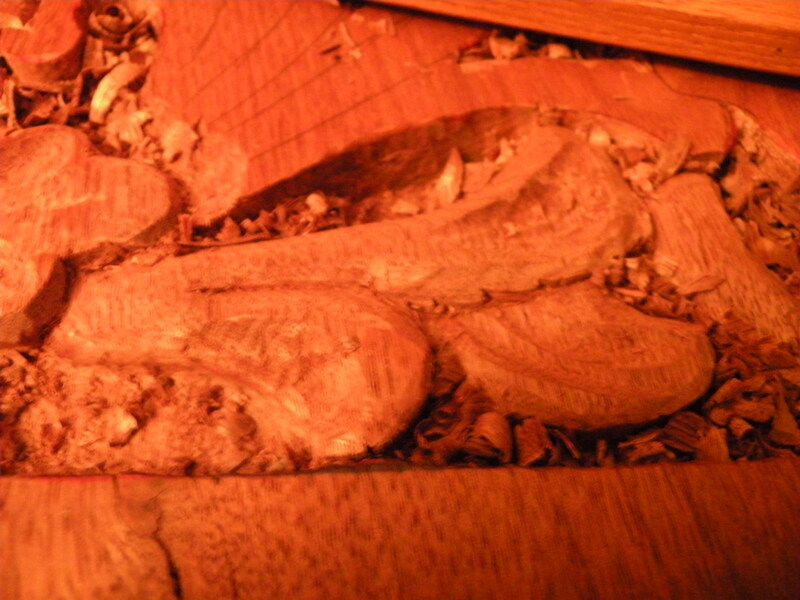 I have taken the corner and removed the first piece of wood to set the depth of the rest of the carving. 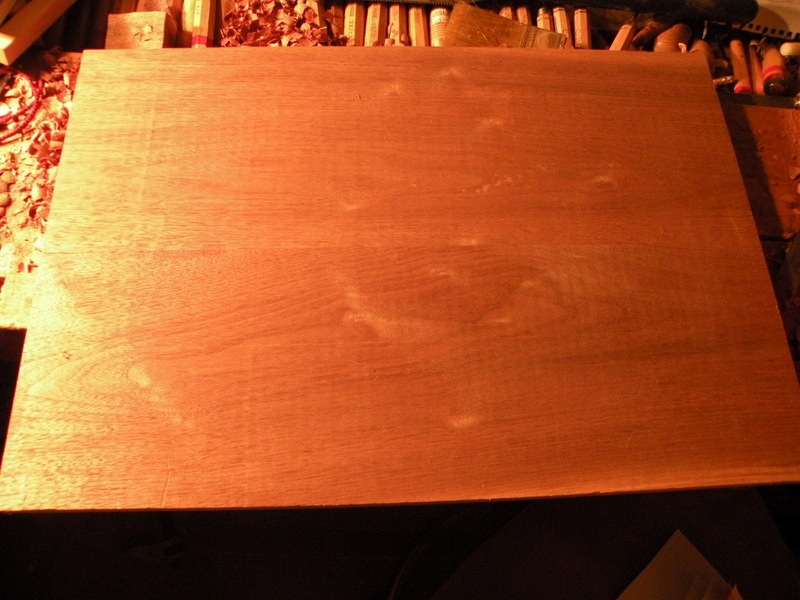 This wood is 1″ thick. The general rule of a deep relief on panel is the go halfway into the wood, thereby allowing the wood to retain its strength which will discourage any future warping. 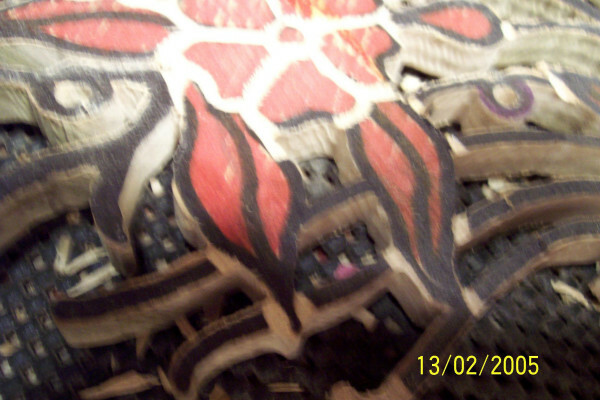 The larger a piece of wood, the more noticable its reaction to the relative humidity of its surroundings can be. Sometimes wood can act like a sponge and absorb good amounts of the water in the air which can slightly change its size and shape. 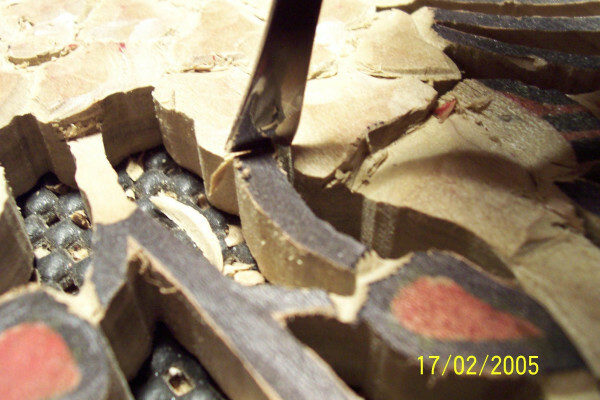 Here is what a proper stop-cut should look like. It should ride just shy of the pattern line into the waste wood. the red area will be removed. 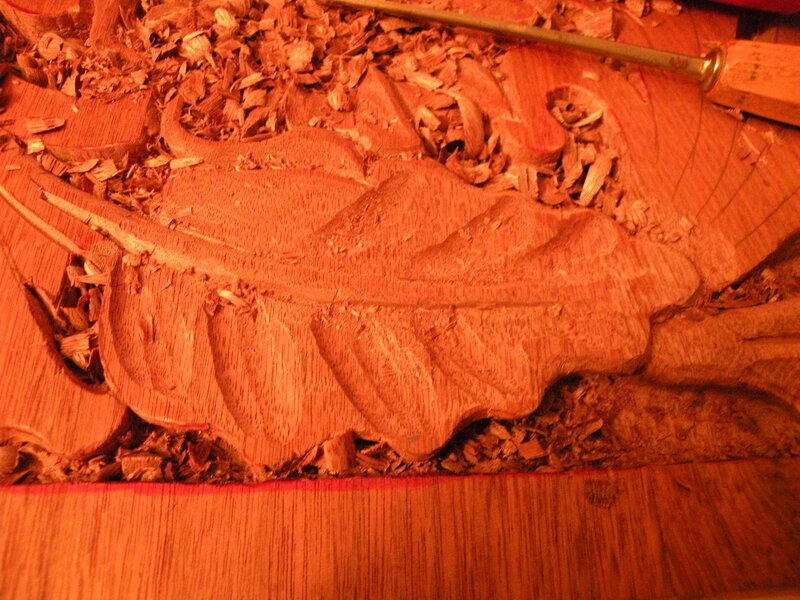 This is where I am after a couple hours of carving. I told you this will be slow going due to the hardness of the wood. 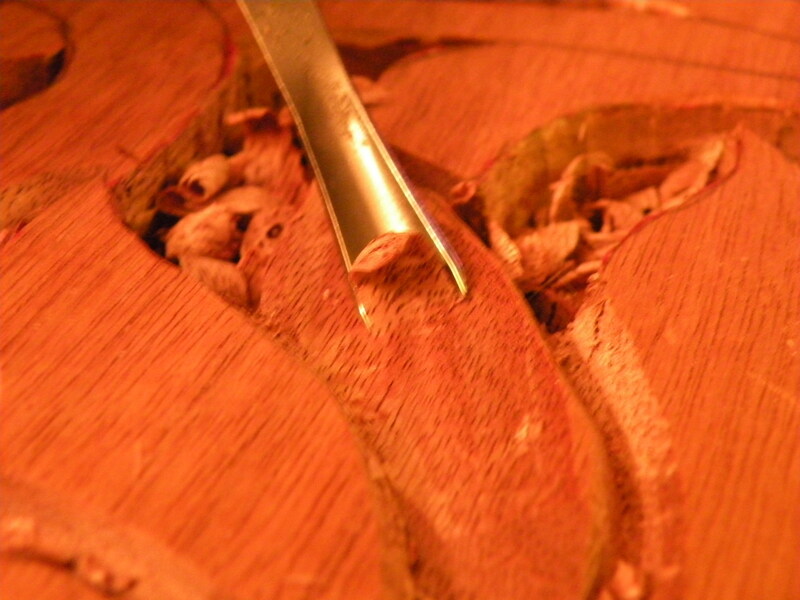 It takes quite awhile to remove 1/2″ of walnut and level the bottom in spaces this tight and irregularly shaped. 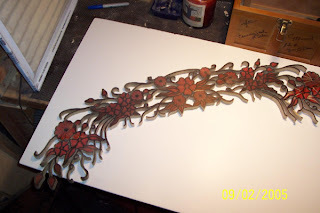 After looking at the entire pattern, I start the design at the part that will need to be pushed the furthest back. once the lowest depth has been established, it is easier to figure out how deep to go with the rest of the carving. I find the corresponding flower on the wood checking to make sure it is the correct area. 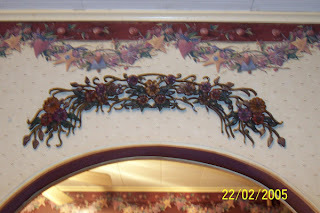 when working with a large pattern, it is easy to get side-tracked and mistake one area for another. Always check and double check. The purpose of this cut is to protect the center part of the flower when carving the petals in towards the center. 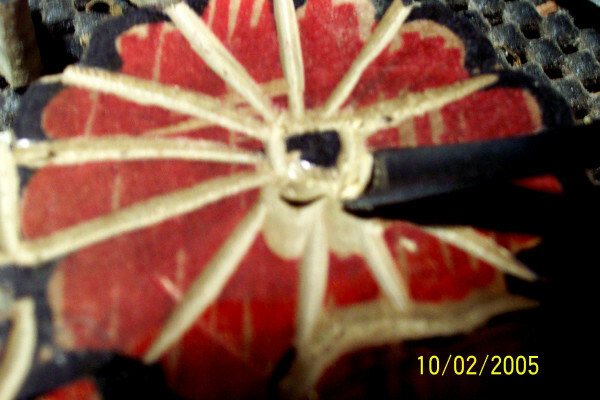 I then move on to the rest of the flower, separating each petal. 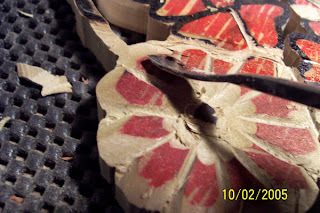 The actual shaping is done using gouges. here I am using a #7 gouge which will create a deep curved surface which the light will play off of. Here you can see that the petal now has a shape to it. All the petals have now been shaped. The direction of the light source can create interesting shadows. 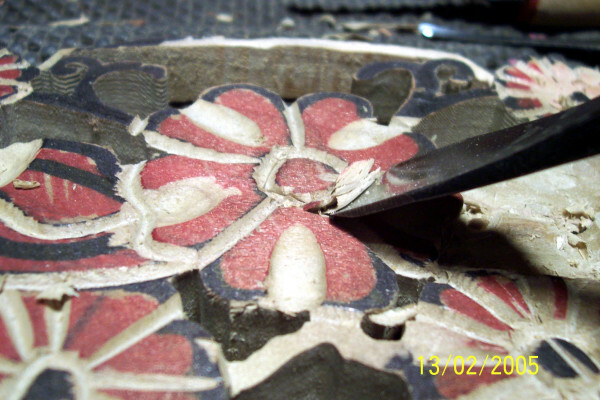 It is always advisable to have adjustable light sources placed at the sides while doing relief carvings. The shadowing effects will change as the light sources moves. 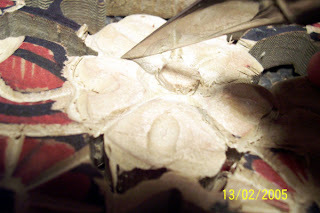 It will enable the carver to decide when the form is pleasing to the eye. 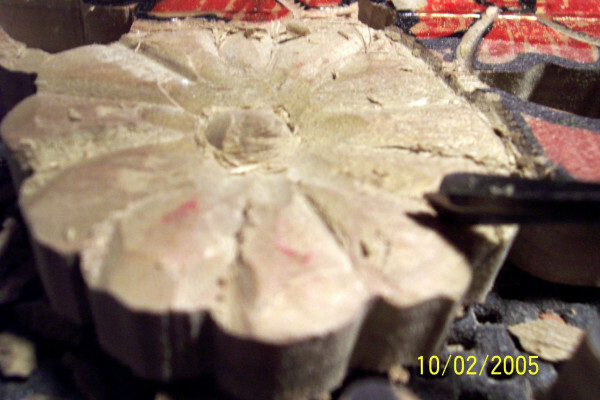 The center button is now formed and pushed further back into the wood. 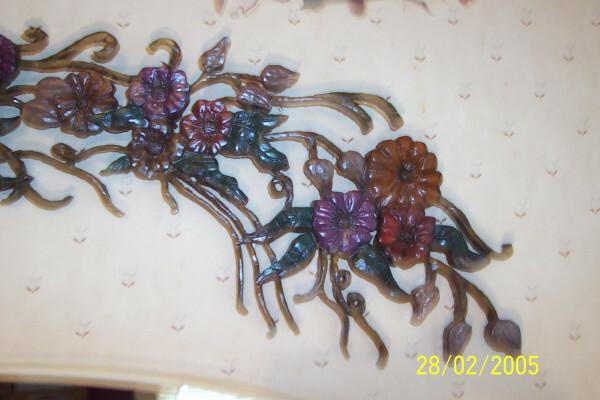 The stems are shaped and played with as an acanthus form. 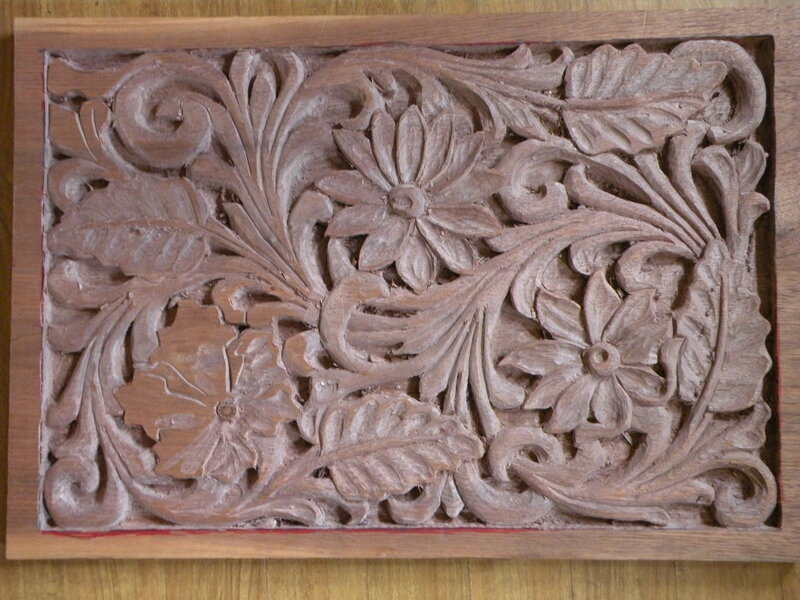 Acanthus carving is a very old form of carving originating with the ancient Greeks. It is a stylized (rather than realistic) form of leaf and stem carving which creates flowing forms. 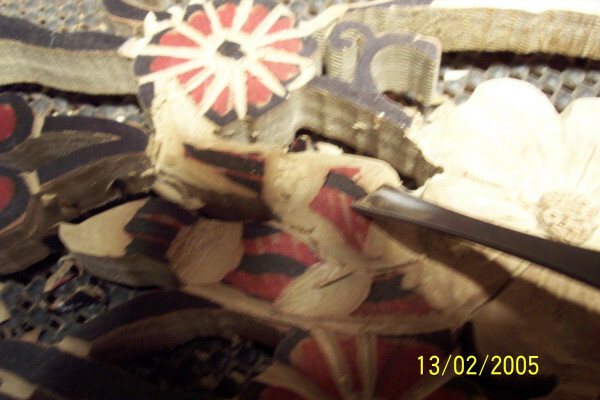 The rest of the carving is now being worked on. Each main form is separated from the next by using the v-tool. Once you complete an area, you work on the next adjoining area. The level of one area will be dependant on the level of the previous area. In this way, things will appear in the right relationship to each other with some things higher and somethings lower, depending on what the pattern requires. 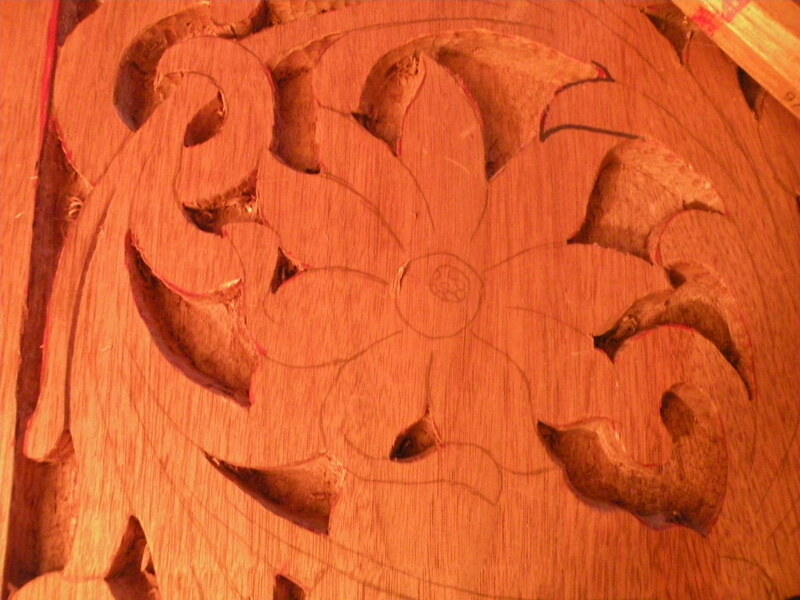 The carving is now well underway with only a few forms on the left side still to be finalized. 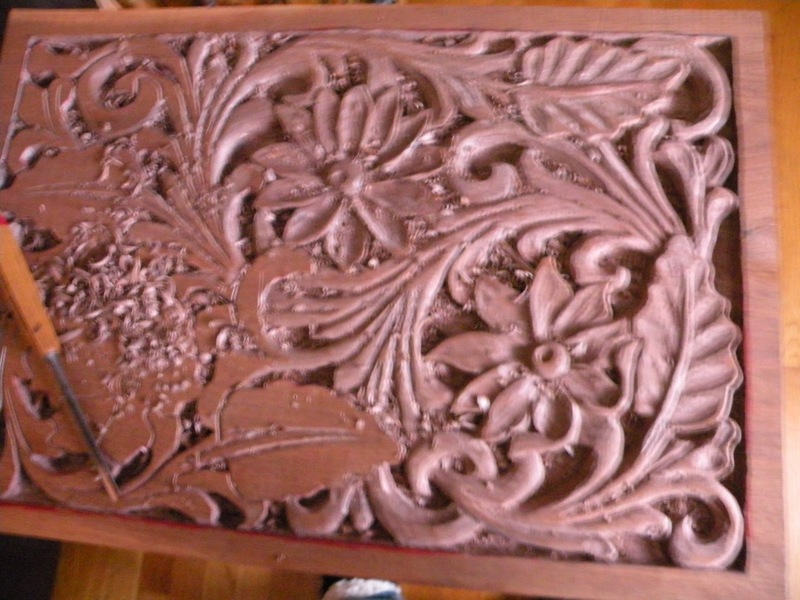 The carving is basically finished and I am working from right to left cleaning it all up. The undercutting is successfully giving nice shadows to the form. I have used some texturing punches to give a contrast to the background.My last step before applying the finish is to sign my work.I have used Minwax Satin Polyurethane for the protective coat. Now the beauty of the black walnut shows through.I hope you can understand why I choose this wood for this particular design. Another wood might not have given such spectacular results.In time and with some exposure to light, this walnut will turn a deep dark brownish-black and will have a very rich feeling to it. 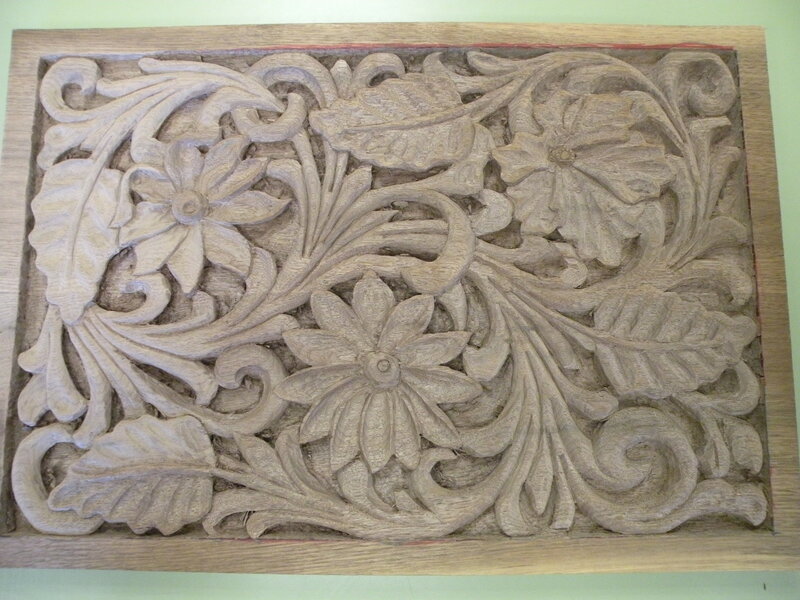 This is the finished carving. 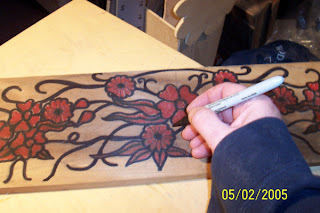 The reward for carving hard wood is wonderful details it takes.Thank You for the inspiration, Jim LinnellI hope you’ve enjoy seeing it progress as much as I’ve enjoyed carving it. Woodcarving can be taught, creativity can’t. A good tool is worth the price you pay for it. Safety can never be underestimated. There are more woodcarvers than you think there are. Most people are held back by their own fears. 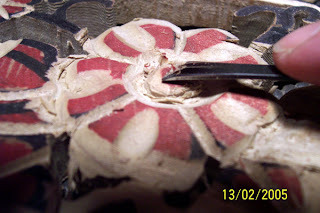 Crazy glue can be used to glue cuts closed. 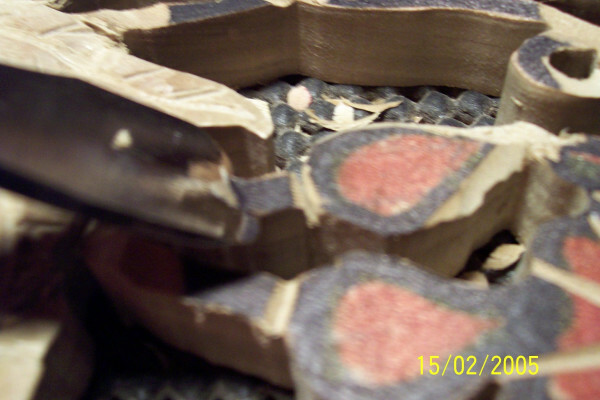 Smaller pieces of wood can be glued together to make larger pieces of wood. If you want to know something, just ask. A good tool becomes an extension of your arm. Inspiration comes from unexpected places. 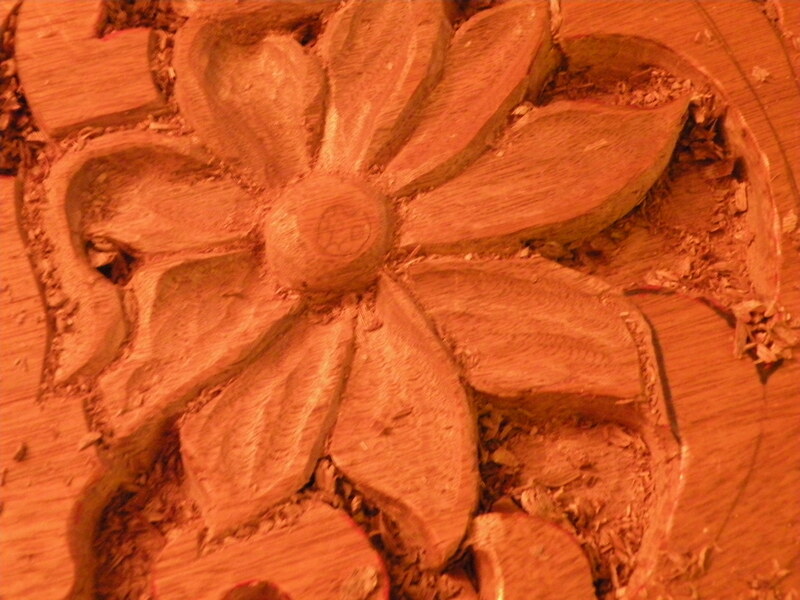 There are no mistakes in woodcarving, only new opportunities. 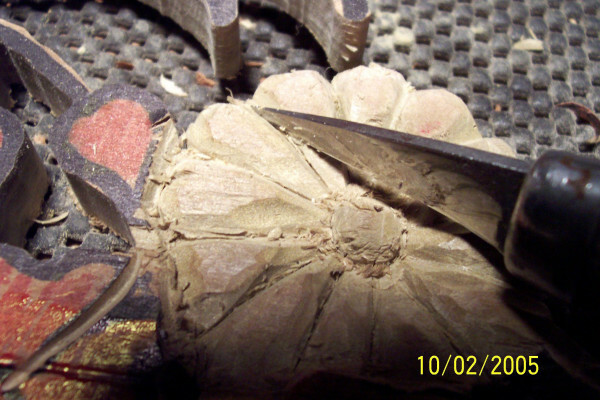 Sawdust in the air can, combined with a flame or spark, can cause an explosion. Always bring wood into your shop at least two weeks before you plan to use it. 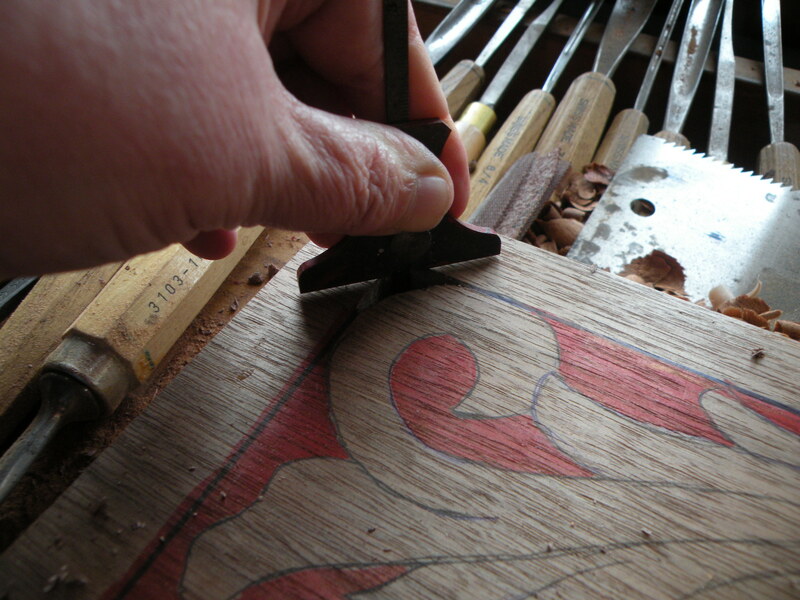 It is much easier to carve using two hands and hold down devices. 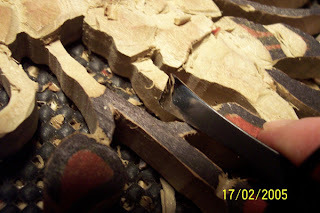 Use a sharp straight edge of broken glass to clean up a carving. Always plan to demonstrate at any show you attend. Those who demonstrate usually draw a crowd. Cover your workbench with inexpensive rubber mats. 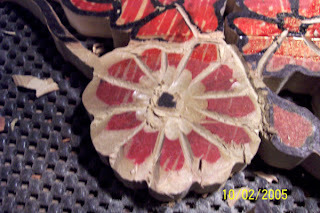 Wood carves easier when “wet” but most likely will crack while drying. The width of one eye is always equal to the space between the eyes. There is always lots of free wood on trash day. The most valuable lessons are learned from your worst mistakes. Standard drying time for fresh-cut wood is 1 year to 1” of thickness. 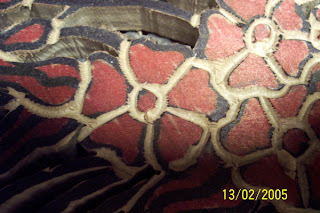 The corners of the mouth line up with the centers of the eyes. A high swivel chair with a back and footrest is the perfect carving chair. People will buy unique items. 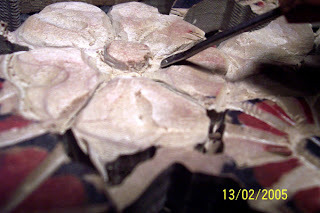 After cutting away the skin of a golf ball, use the excess skin for a paint cup. 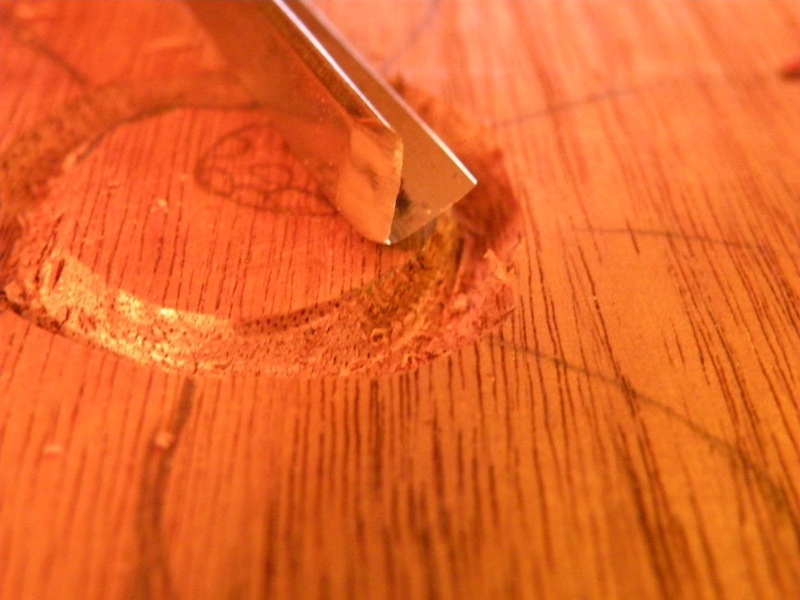 Turn a problem area upside down and then try to carve it. Wood dust can cause cancer and other diseases. 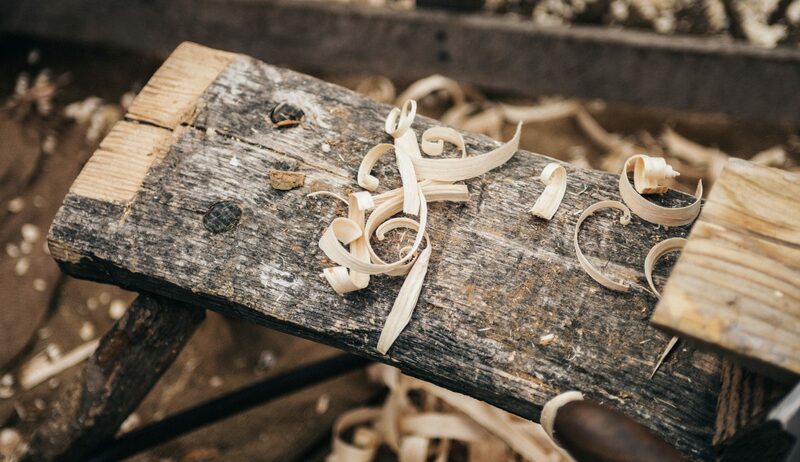 Most carvers have a variety of different woods stored away in their workshops and will pass a piece or two on to a new carver. Young children can carve soap but the chips are slippery. You can make excellent woodcarvings with a single knife. A power saw can cut faster through flesh than wood. Never stand in a direct line with a table saw blade. 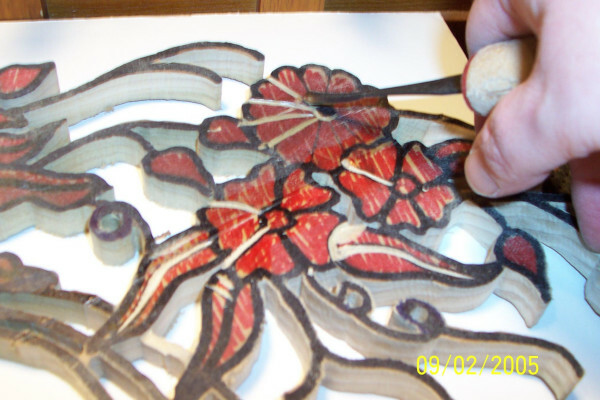 Use a v-tool for outlining, not using stop cuts will save lots of time and you will not crush the wood fibers. Thin cardboard can be used as a strop. Shave the hair on your arm to test the sharpness of a tool. When picking something thing up, you will knock over another, maybe even 2 or three. The more costly a tool, the more likely it is to jump off your workbench. 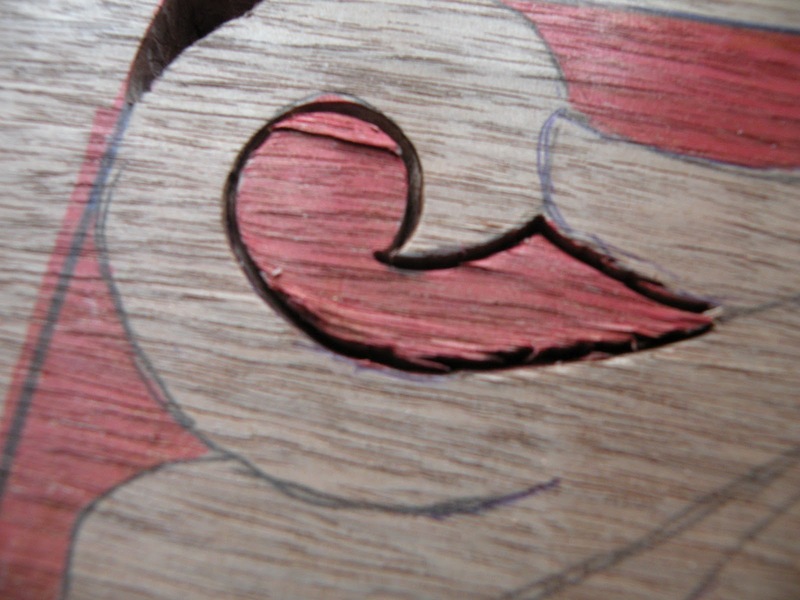 A mixture of 50% rubbing alcohol and 50% water sprayed on wood will make it easier to carve. Grinling Gibbons glued layers onto his carvings. 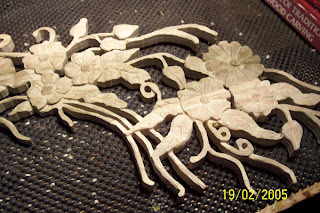 Let the customer be involved, update them on their carvings progress. Email them pictures in various states of completion. There could be only one master carver in any one municipality. 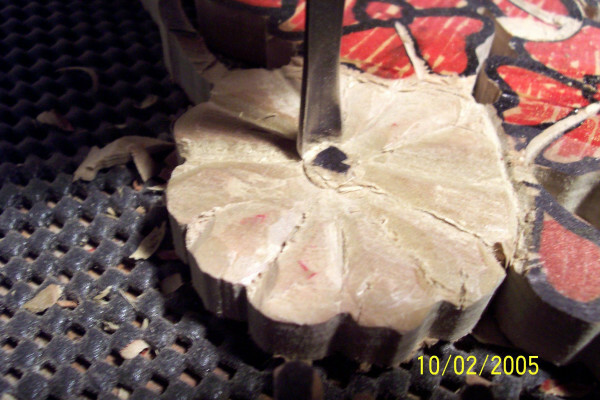 You can burnish wood by using a rounded piece of hardwood to press into your carving. 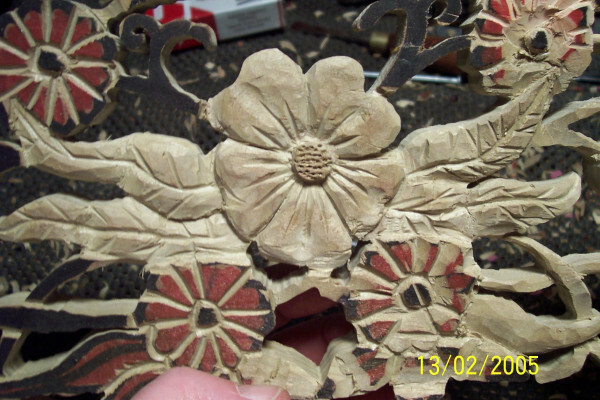 Woodcarvers are the most helpful group of people that I have ever met. 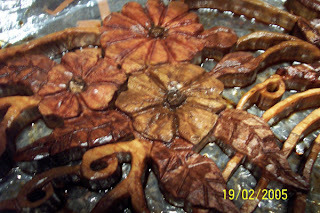 Slowing down wood drying time will lessen checking. Why this carving woman needs a wife—-Its Saturday morning and I wake up. I sit at the pc for a moment to collect my thoughts and read my email. I think about what I will do with the rest of my day. 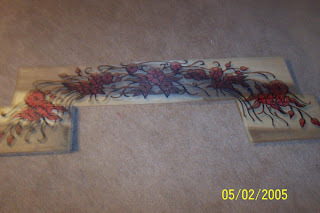 I know what I want to do, I want to carve. But then I think about what I have to do. Laundry, food shopping, cleaning dust bunnies, take the dog out, If I want to eat I will have to cook. I just want to play today. I have been in a carving slump lately. Today is a dreary rainy day. It is a great day to carve. However, if I don’t take care of the things that need to be taken care of, no one else is going to. Sometimes, it seems like it would be better to be a man from the 1950s. When a man and a woman live together, they must have their own activities. The man usually wanders out into the garage or down into the basement, or goes to a friends house so that he is not underfoot. This allows his wife to get her work done. Now I am a woman so this may sound funny coming from me but I do believe that a wife does housework better than a man. My brain is more like a man’s. I tend to walk over and around things. Until I actually trip over something I don’t really see it. I have no explanation for why that is. I like to work on the cars. I like to do repairs. I like to work in the yard. It’s not only that I like these things, I am actually better at them. I am not good at housework. If I were given a task to do, I could do it adequately. But I just do not see what has to be done. I am sure that this comes in some way from how I grew up. My mother did not do housework. Things did get to the point where we tripped over the clutter. It is almost as if my brain is programmed not to see something until it absolutely must. So for me housework does not come naturally. It takes a great deal of effort on my part. I find every excuse in the world not to do what I should be doing. Right now I’m sitting here writing a blog instead of doing my dishes. I did take the dog out but that was only because she cried to go out. All I want to do today is carve. Is that so wrong? 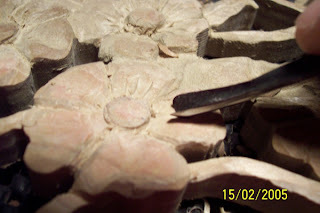 As a relative youngster in the woodcarving world, I have witnessed the passing of many older woodcarvers. Each has been special in his or her own way, and I have felt the usual feelings one does when a mentor, friend or colleague leaves this world but the recent passing of George Reinfried, 78, of Lancaster Pennsylvania, has had a profound effect, not only on me but on the woodcarving world at large. For those of us lucky enough to have known George, there are no further words needed. He was a humble man who probably would have preferred not to have any fuss made about him but for those of you who never had the pleasure of meeting George, allow me a moment. I know George will forgive me. George Reinfried was a simple man, leading a quiet life. He was born and died in Lancaster, Pennsylvania. He was married to his wife Ann for 29 years. Together, they raised 8 children, had 12 grandchildren and 8 great-grandchildren. He was a printer for the National Cash Register Company for 25 years and was an avid hunter, fisherman, camper and golfer. He was a man of faith and a member of the Emmanuel Lutheran Church in Lancaster. He found no greater way to spend his retirement than to be in the company of his beloved family. These things alone would have been a great legacy for the average man. But George was not your average man. 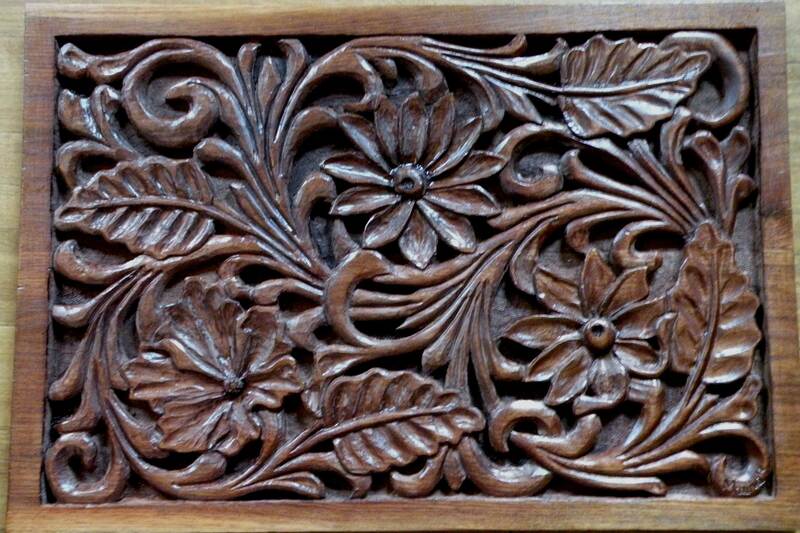 George was a woodcarver. George had never planned to be a woodcarver but the day that George met Jack Miller of the Lancaster Woodcarving Club at a woodcarving show, the direction that George’s life would take changed dramatically. What began as a hobby to pass the time in his retirement years soon became a passion to promote woodcarving in his corner of the world. Jack, already an accomplished carver, invited George to start carving with him in the evenings and George took him up on his offer. Georges’ first carving was a labor of love, a cane with his pointer Katie on it, his beloved dog who had just passed away. 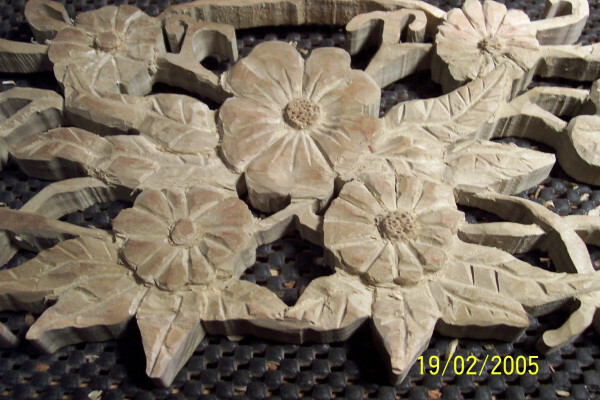 George continued on his personal carving journey in his basement workshop and could often be found on nicer days, carving out on the patio. 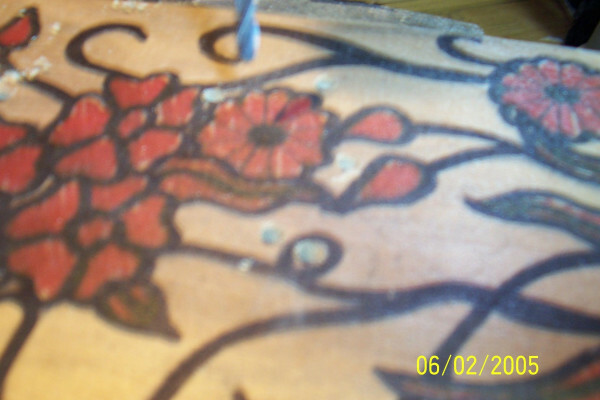 He graced his family with many a wonderfully carved gift. 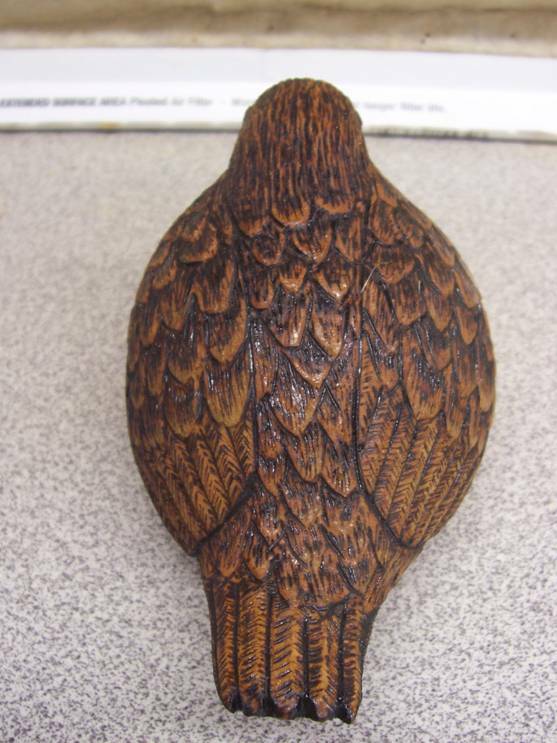 George also found that he enjoyed carving birds, with each and every little feather burned into the wood. 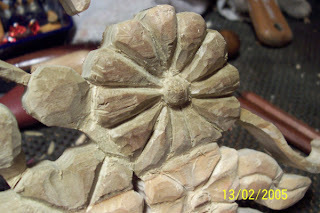 George eventually joined the Lancaster Woodcarving Club. Along the way, he also became a member of many other woodcarving groups, the York Carving Club, the American National Cane Club anda small group of guys that would get together each week in Ted McClains garage. 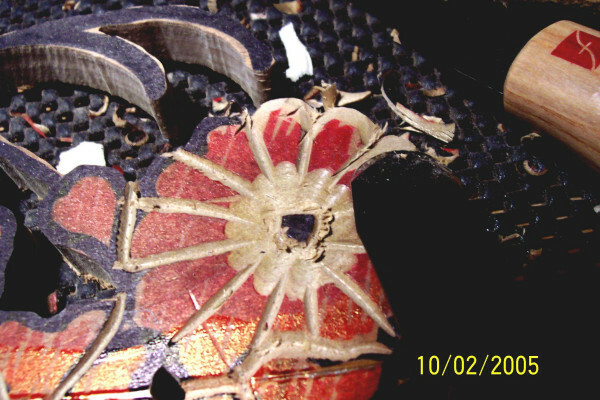 they kept the number to 7 members and called themselves the WoodBee Carvers. The story could end here but the best is yet to be. 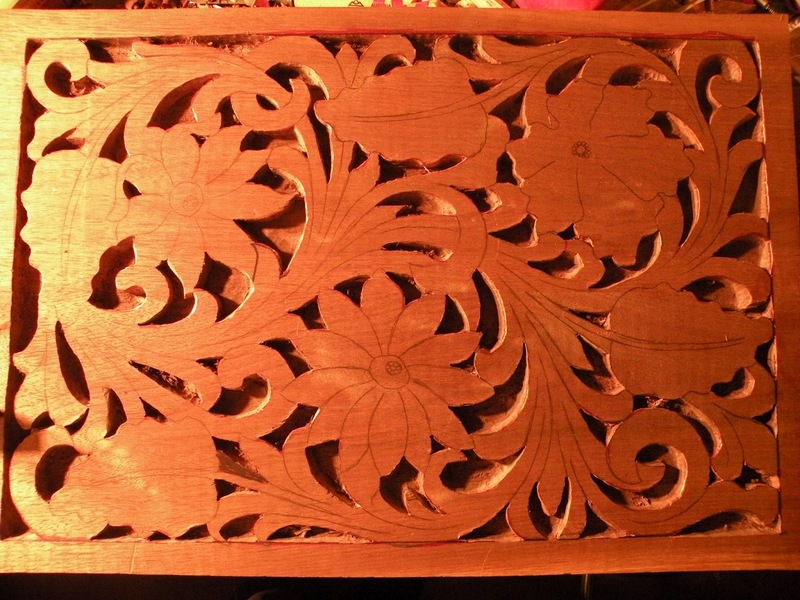 As George got deeper into woodcarving, he and his wife, Ann began accompanying Jack Miller, traveling in their RV to other carving events throughout the country. After traveling to a large woodcarving roundup in Evart, Michigan a few times, where free carving instruction was being offered, George had an idea. “Why don’t we have anything like this on the east coast? Lets give it a try.” Sandy Holder of the Michigan Roundup reassured, “If you have it, they will come.”With the support of his wife, Ann and Jack Miller, he contacted family friends Al and Cindy Waiter who just happened to be the owners of a large camp ground in Honesdale PA, high up in the Pocono mountains. There was no stopping George. He just kept talking about it and dreaming his dream. 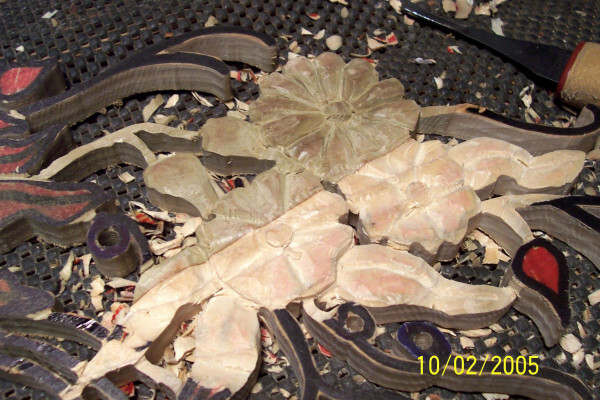 In 2003, George and Jack began contacting talented carving instructors around the country. 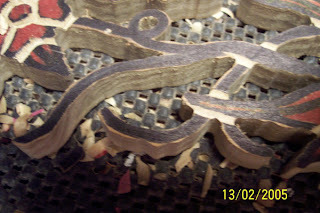 Ann contacted lots of carving clubs to get the word out. 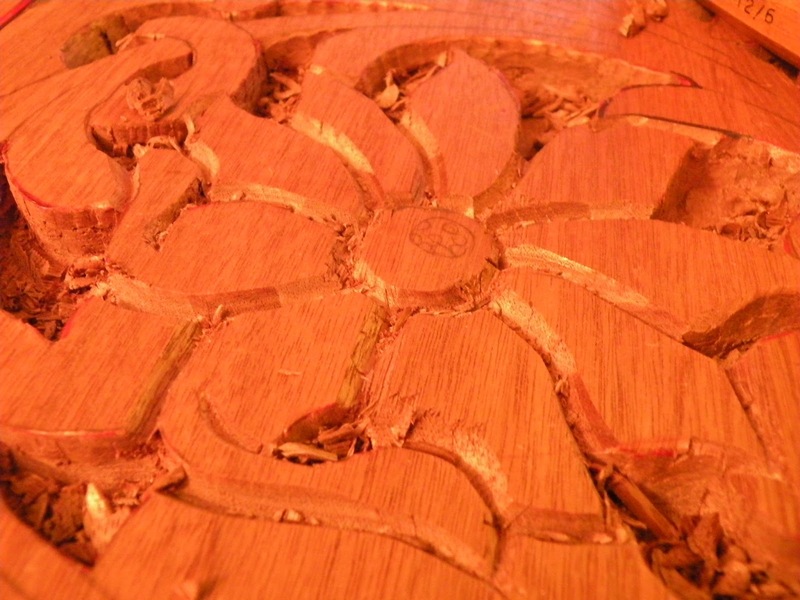 The Northeast Woodcarvers roundup, which became known as the NEWR was underway. As a result of the first NEWR, a caving club was formed at Cherry ridge. Bob Muller and the Cherry Ridge Woodcarving Club got involved in this endeavor and things just took off. George, Ann, Jack Miller and the Cherry Ridge Carvers have since been organizing this annual event. 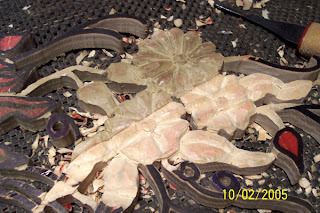 The NEWR now attracts approximately 300 woodcarvers from all over the east coast, from Canada to Florida. 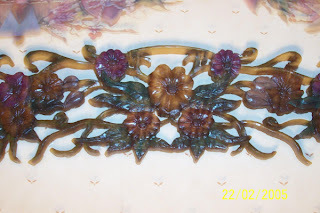 Its premise being that it was a place for woodcarvers to get free excellent instruction from skilled instructors and while it excelled in its intended goal, I find the NEWRs greatest achievement was the camaraderie among woodcarvers that it has fostered. There was “something for everyone” at the NEWR, carving contests, pot luck suppers, non-carving classes, beginner classes and classes for children as young as 14, ice cream socials, trips into Honesdale, Pa for Music in the Park, sing-alongs and funny presentations by the instructors. George was the leader of a merry bunch of misfits and cut-ups, who made the NEWR special. What I personally will always remember was the twinkle in his eyes when he laughed. It was contagious. George set the tone for the NEWR and down played any of the work involved with organizing it. The NEWR was playtime for George, often sneaking into town to partake in huge bowls of ice cream with dear friends. 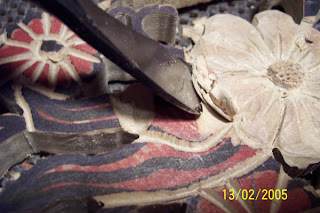 If he had one fault, it was said that George could not talk and carve at the same time and woe-be-gone to the carvers who sat in a class that George also took. There would be much more laughing than carving going on. George also had a more serious side as a woodcarving promoter on a national level and became a personal mentor of mine as he playfully cajoled me into becoming a NEWR instructor. I was already an instructor for the Parks Dept in New York City but George did not understand that teaching in a city of 9 million people was immensely less intimidating than joining the ranks of his esteemed carving instructors at NEWR. It took him a few years and he never let up on me, never let me doubt myself as he put his gentle hand on my back and pushed. That’s who George was, a playful man with a big heart, who encouraged children and adults to try their hand at carving, much as Jack Miller had once done for him. He even helped his wife start carving. The Lancaster Woodcarving Club awarded George their highesthonor, the John Harrington Award, not just for carving but for participating in allclub activities. Jay Herr and George started beginner carving in the Park and it hadbeen held each fall in Lancaster. He and Ann were contacted by a woman that taught home school and asked if it would be possible for their club to teach 14 students for 10 weeks, 3 hours a week. Of course George said no problem, and in turn George and Ann approached the Lancaster Woodcarving Club members and had many willing to participate, and now for the last 6 years the club has been teaching students age 14 – 18. 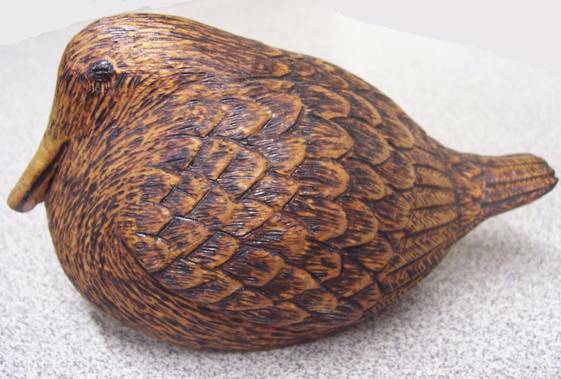 George also started inviting guest carvers, Floyd Rhadigan, Mike Bloomquist, and Don Dearolf for seminars at the Lancaster Woodcarving club, George handled all details. Two years ago, George thought it would be great to have carving seminars held in a beautiful building in the Lancaster County Park, with his wife, Ann cooking breakfast and lunch. Forty carvers attended. The instructors were Pete LeClair, Don Dearolf, Jan Oegema and Bob Statlander. Georges’ story could end here, but it doesn’t. His true legacy is yet to be seen as George has had a direct hand in beginning and improving the carving careers of many a talented woodcarver. Ann and Jack Miller will, no doubt, continue to be driving forces behind the dream that George once envisioned. There will be more carving and more laughing as the NEWR has now become bigger than George, Ann and Jack could have foreseen. It has taken on a life of its own. This year will be a tough one for the NEWR as the pain of losing George will be a fresh wound on the hearts of many. Among the din of all the carvers talking and laughing and the instructors teaching, there will be an unplanned moment of silence when I will swear I can hear Georges mischievous laugh float through the air. I will choke back a sob and I will smile. Thank You George Reinfried! Thank You for all you’ve done for the woodcarving world but more importantly, thank you for who you were, a humble giant. George will be looking down on us from that golden workbench which is magically always clean, where the tools are impossibly always sharp, the wood is wonderfully sweet and carvings actually get finished in a timely manner. He will still be laughing and smiling. He will still be George, my friend. How do you become a woodcarver? 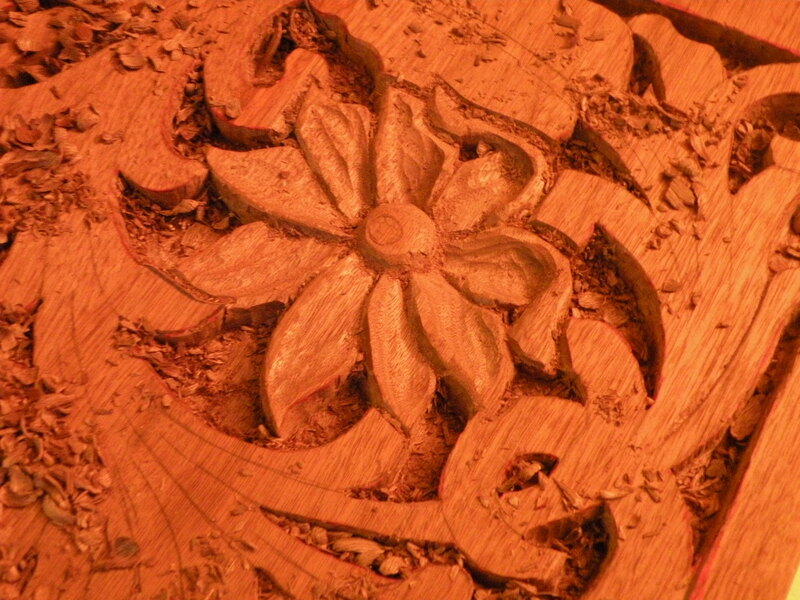 Maura on How do you become a woodcarver? 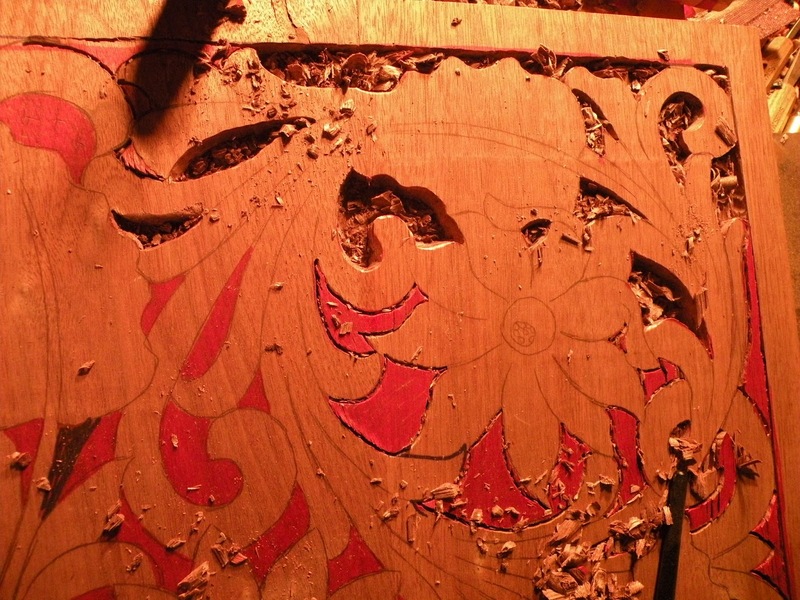 The State of Woodcarving in America today part 2.